Mr. Wackenteach Teaches First Grade is the first volume in The Wackenteach Series written by J.C.M. When summer was finally over, there were a lot of students who were wondering what first grade would be like. They would ask their parents all sorts of questions about school, but one of the most popular questions was whether first grade would be fun. All the moms and dads were ready for these questions. They knew that first grade was a happy and special place, and each set of parents told their child that they had nothing to worry about. When the next morning arrived, the children were ready to start first grade. They went up to the classroom door and heard a voice telling them to come inside, but when they entered, they found an empty room. The boys and girls searched everywhere until they heard a loud snoring noise emanating from underneath the teacher's desk. When they realized the source of the noise, they all ran over to check -- and there he was. Their teacher was curled up on his side and taking a snooze as they watched. There's an air of mystery, magic and suspense that pervades each page of J.C.M. 's children's book, Mr. Wackenteach Teaches First Grade. Mr. Wackenteach reminded me a lot of Willy Wonka, though I was relieved to discover that he was not quite as dark a character as Wonka sometimes got. I found myself wishing I could do first grade over again with the kind of teacher Mr. Wackenteach is. This is an entertaining and beautifully written story about a first-grade teacher who delights and beguiles his class as they begin their academic careers. 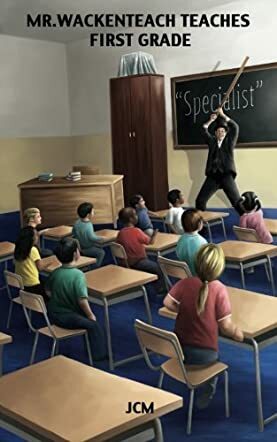 I loved the way anything basically goes with Mr. Wackenteach as long as his Specialists remember that each of them is special and none of them are bullies. The drawings that accompany the story are lovely, minimalist sketches that give enough detail to keep the imagination working to fill in the blank spaces. Of course, there are the drawings of that very special teacher as well, and those I couldn't help but examine rather closely. Mr. Wackenteach Teaches First Grade is a marvelous introduction for kids who are getting ready for first grade. And as long as Mr. Wackenteach is the teacher, it's guaranteed to be a fun and special place indeed. Mr. Wackenteach Teaches First Grade: The Wackenteach Series, Volume 1 is most highly recommended.